SQL-Server Blog of Ritesh Shah --Fight the fear of SQL with SQLHub.com: Training – useful or useless? Training – useful or useless? 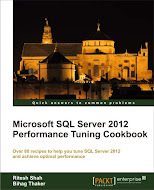 My very good friends and SQL Server icon Mr. Pinal Dave wrote 5 articles on this wonderful topic “Training”. I often see debate among developer whether training is useful or useless but according to my personal opinion, Training plays very important role in the life of professional so let us not discussed whether it is really useful or useless as Pinal has already had so many details in his 5 articles and I am sure it will change your attitude towards training if you are not so much positive towards training. Training enhances skill level of professional. Though a benefit of training is intangible but investing in training benefits both, employee as well as organization. In today’s age there is rapid technology innovations comes into the market and making the employee trained for those innovations ultimately benefits company as well as employee both in order to stand in market with cut edge technology. Learning & Training are the processes, any human follows lifetime. At age of toddler, we are being trained from family regarding how to eat, how to walk, how to talk etc. In the kindergarten we are having social training for our transition from home to school then schooling and college and so on……….